Jewel-mixed polo or ‘morasa polo” is a dish I often make when I want to impress my visitor :), of course served with fried or oven-cooked chicken. It has a unique taste – a bit sweet with the dominant taste of sweetened orange peel. In all fairness, this is quite a complex recipe to start my Persian cooking list with but I love the color so I went for it assuming many of you know the basics. If not, nothing to worry about. I will explain how to prepare plain rice in a separate post shortly. some salt and cooking oil. Method: Plain rice is made the usual way (soon to be explained separately) by soaking in salted water, draining, boiling in lots of water, draining again, and steam cooking for at least one hour. Fry raisins in a frying pan with a little oil for 2 minutes. Fry the barberry, 1 TS sugar and 1 teaspoon saffron for 2-3 minutes (don’t fry so long to lose the green and red of the berries). Very briefly, fry sliced almond too, but w/o oil. All sliced materials (almond, pistachio and orange peel) will be wrapped separately in aluminum foils and go into rice pot just to keep them warm. 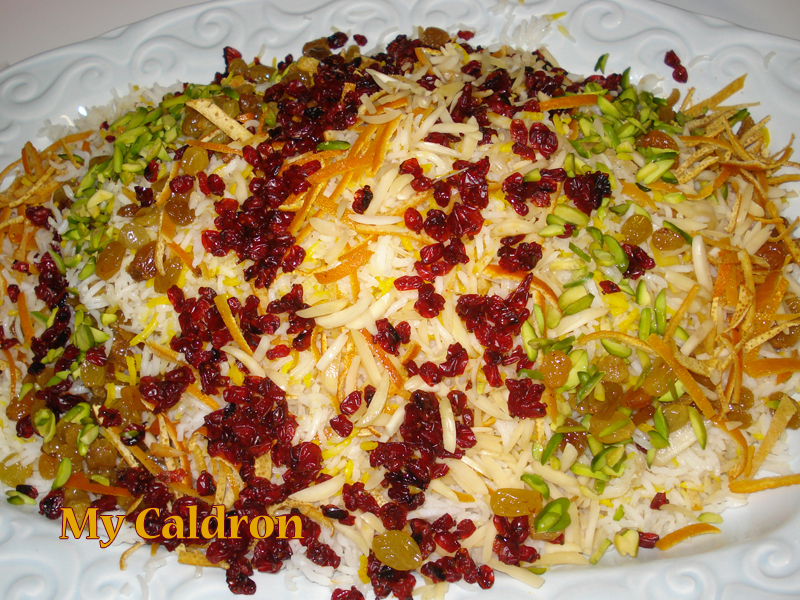 Decorate the plain rice with all the five items – the jewel. To sweeten the sliced orange peel, soak them in cold water for several hours and change the water at least twice. Then put them in warm water for five minutes, drain, put in the warm water for the second time with two tablespoon sugar and stir well. Drain. The peel must be free of its taste w/o loosing its orange colour.